Canyon live oak is a vastly underused, beautiful evergreen native tree. From Lane county, Oregon south through California, slight parts of Nevada around Lake Tahoe and sporadically in Arizona and even New Mexico. This venerable tree is found on the steepest slopes of canyons and mountain ridges. 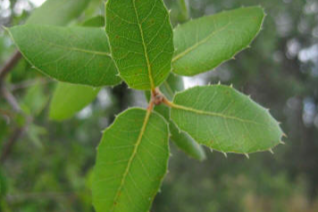 In Oregon it represents the northern most native Live Oak or evergreen oak in North America. Leaves are glossy army green on the the top with a conspicuous furry gold underside. This is a rugged, tough tree that should be used in both gardens and as a street tree. In the Alameda neighborhood in Portland there is an ancient specimen to 60′ tall and wide with a large trunk. This heritage tree was reportedly brought to the city from southern Oregon via horse and wagon. Slow growing in youth it picks up speed exponentially several years after planting. To 40′ x 20′ in 30 years with a broad spreading crown. In the wild it often forms a gnarled multi-trunked rounded outline. Its very possible to train this tree to a single trunk/leader to extend the crown skyward. Extraordinarily cold hardy enduring temperatures slightly below 0ºF with no difficulty. The large acorns are born in a showy golden hued furry cups- and are produced profusely in banner years. Water to establish for the first season then none in subsequent years. Full sun. Beautiful, native Oak that we cherish at Xera. Oregon native plant. Cork oak. 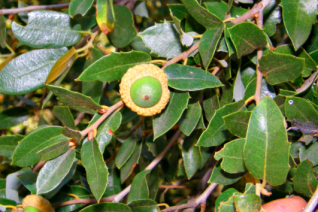 The commercial source for high quality cork comes from this evergreen mediterranean native. A large growing tree with a rounded crown. To 35′ tall and half as wide. As the trunk grows (expands) it develops the corky bark very quickly. Harvest correctly and it does not harm the tree. In mid-spring golden tassels eventually become acorns- loved by wild life. Frequently planted as a street tree in the city of Portland. Very, very drought tolerant, in fact it really should not see any water during the summer. Eventually casts a good amount of dark shade. Beautiful tree that is amazingly adaptable to freezing rain and snow. Grows about 2′- 4′ per year when established. Very climate adapted. Silver Leaf Oak from Arizona is a favorite tree at Xera. 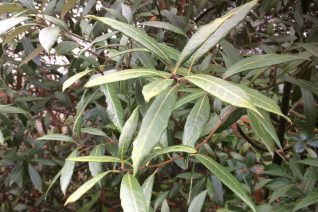 Tall, rounded evergreen tree with skinny but thick leaves that are sage green on top and silver white on the underside. Its handsome all the time and even prettier when the gold catkins protrude from the foliage in spring. Naturally develops a straight trunk. Fast growing tree in our climate to 35′ in 12 years. Casts dense shade but tolerates limited summer water. Extraordinarily cold hardy. It has endured subzero readings in Eugene without injury and I even encountered one in a garden in Denver. The leaves were kind of toasted from the previous winters -17ºF(!) but it was obviously thriving. Native to the mountains of SE Arizona at very high elevations and that translates to LOVE for our climate. Exceptional leaf form and shape. I collected the acorns of this tree near Lake Isabella, CA in the southern Sierra Nevada. It was a particularly handsome form of what can be a less than majestic species. Densely foliaged with a straight upright trunk about 25′ tall with a rounded crown. Wow. We hope the progeny are as cool. Interior Live Oak of California. Evergreen tree to 25′-35′ tall with a spreading crown. 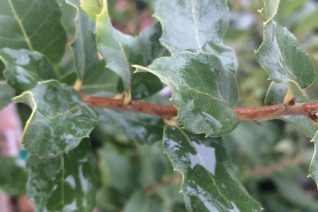 Was native in Oregon in the past as hybrids known as Mohr Oaks (Quercus kelloggii x Quercus wislezenii) still can be found. Hardy to short shots to 0ºF. Grows about 2′-3′ a year in youth. Water to establish the first year then none in subsequent years. Oregon white oak. 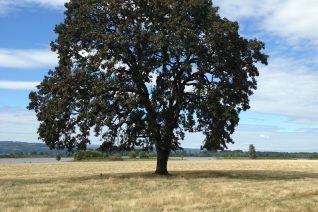 A monarch of a tree locally native and forming Qak Savanna communities in the Willamette Valley that preceded european development. Slow growing tree of great age and grace. Deep green foliage forms dappled domes in the high rounded canopy. Birds and wildlife adore this completely summer drought adapted tree. To 130′ but not in your lifetime. Our acorn source is local. Whitish bark in patches and it will often develop pure white patches at the base- an outlet for sodium from the constantly saturated Oregon winter soils. Tolerates the most impenetrable clay and shuns summer irrigation. Fall color is russet orange. Grows just 2′-3′ a year in youth -if really happy. This as all oaks has what are referred to as banner years. In certain years huge amounts of acorns are produced. This is thought to overwhelm predators and at least a fair amount can germinate. Famous for its moss covered enormous branches which have been likened to the perfect depiction of a Grimm’s Fairy Tale. Oregon native plant.